There's no hiding the truth... it's a great bundle! Fanatical is excited to showcase our next 'Spotlight on...' bundle, filled with retro-style and quirky 3D titles from Merge Games. 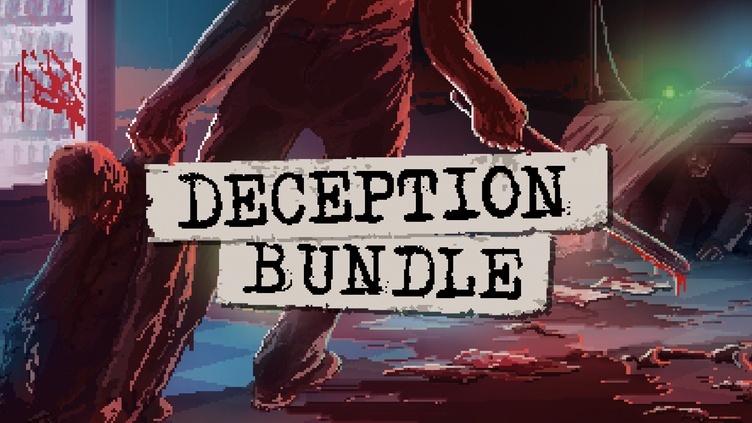 Featuring eight Steam indies with a total 97% off, the Deception Bundle brings a fresh batch of action and adventure to your library. Explore the puzzle-filled fictional town of Baervox and try to separate dreams/nightmares from reality in indie thriller The Long Reach, go gung-ho in a dystopian future with action FPS E.T Armies, and embark on a journey of self-discovery and enlightenment with the surreal point and click adventure The Rivers of Alice - Extended Version. Keep your finger on the trigger as they're zombies to slay in fast-paced 2D survival shooter Zombie Kill of the Week - Reborn, and - when you're done with the undead - there's some pesky veg to deal with in the manic top-down shooter The Walking Vegetables! E.T. Armies is the Deluxe Edition; it does not contain extra apps in comparison to the normal version, but it contains an extra depot. This means that no matter which version you have, you will see "E.T. Armies" in your library, and you will be able to activate the key from this bundle if you already have the E.T. Armies non-deluxe edition (and therefore waste it in the process). It does not generate an extra gift in the inventory. Will you sail through the Rivers of the Deception Bundle? [Buy] I can't wait to Unbox these games!!! [Split] Zombie purchase of the week: I bought it, now what do I do with my leftovers? [Have] What a deception, I thought I'll get new games, but apparently I own these already. [Skip] Yep, I'm one of those purchase Dodgers. I will probably buy it since I don't own any of these titles. Cheers and thanks for the chart. Wow, The Long Reach, that's a surprise amongst the others. I won't buy it, but it surely has some good games in it. And E.T. Armies. just for those vegetables? ...are those veggies good, at least? I may consider this for Rivers of Alice and The walking Vegetables. The latter I played during a couple of days of free trial and, even if similar games are dime a dozen by now, it was really enjoyable. The Long Reach is an awesome game. Seems like E.T. Armies gave Deluxe Edition, decided that going to give it a try. Long Reach and Walking Vegetables were on wishlist so nice bundle. The Long Reach? Nice! Too bad I want none/have what I would want of the others. I'll have to ponder over this bundle. Mmm, Long Reach, tempting. Not sure how I don't have E.T. Armies yet, but I guess I don't. For the rest, well, I have what I'd want and I don't want what I don't have - not quite a purchase, I don't think. Well, The Long Reach alone is worth the price of entry here. The Long Reach is in my wishlist for whatever reason, don't think it's enough, tho. Does activating E.T. Armies still give you a Steam gift in your inv as well? Can confirm that it does not. Wasn't aware that it used to, looked it up, and the now-deleted news post about it seems to mention it was a limited time thing in early 2016. Thank you for checking. It probably isn't a thing anymore because Steam stopped doing gifts all together. No steam gift copy for me, but it did give Deluxe version for the game which isn't mentioned in the topic. Thanks! I added a note about this in the OP, since it's not mentioned on the Fanatical page. I have my eye on Unbox as a decent platformer and Mainlining as an 8 bit Orwell, but not much else piques my interest here. I may buy the bundle at the 11th hour if I don't end up with them through gifting or trading. Bought it solely for Long Reach. Maybe I'll find a gem or two in the rest of the bundle. Best of luck with it. Its the one game I think most people want from this bundle. The bundle is back; same price as in January. Huh, I wonder why I skipped this last time. I'm missing 6 of the 8, and most of them look like there worth a try.